Dr. Johnston at Ascent Dental Group offers sedation dentistry that makes most dental procedures pain-free. No matter what dental procedure you’re having, Ascent Dental Group and Dr. Johnson can help you stay calm and remain comfortable while your teeth are being treated. Nitrous oxide. Commonly called laughing gas, nitrous oxide is given through a mask placed over the nose and face. If you use nitrous during a procedure, you may feel giddy while you’re being treated or shortly after. The effects wear off quickly, are safe to use. Oral sedation. Oral sedation is a pill taken orally, that is prescribed by your dentist sometime before your dental procedure. This type of sedation enables you to feel very relaxed, but you’ll still be able to follow your dentist’s directions during the procedure. The effects of this medication take a little longer to wear off so you may need to have someone drive you home. IV sedation. 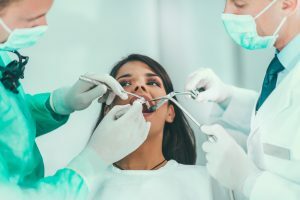 Using this type of sedation requires placing the medication directly into one of your veins, usually in your hand, to achieve a moderate level of relaxation during dental treatment. During IV sedation your blood pressure is monitored, and you are in a more sleep like state of relaxation. You will need to have someone drive you home from the appointment as the effects of the medication last a bit longer. If you are planning to have dental work done, please discuss using sedation dentistry with our staff for stress-free dental treatment.